There are about 12 miles of creeks running through Downers Grove. 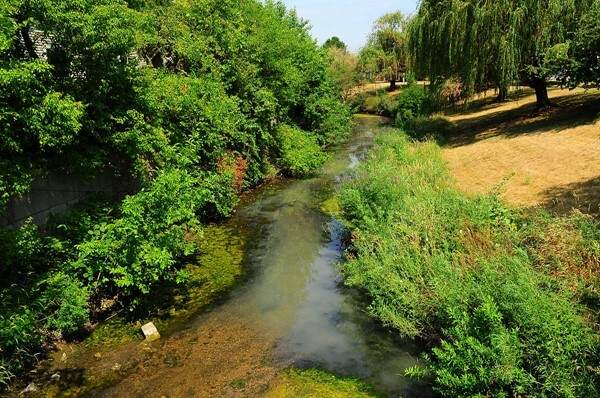 Not only are creeks integral parts of the stormwater system of our Village, but they also play a critical role in the quality and supply of our drinking water in general, by ensuring a continuous flow of clean water to surface waters and helping to recharge underground aquifers. Creeks are dynamic, and will widen and meander over time. Erosion of the banks naturally occur, and serious erosion can compromise water quality. 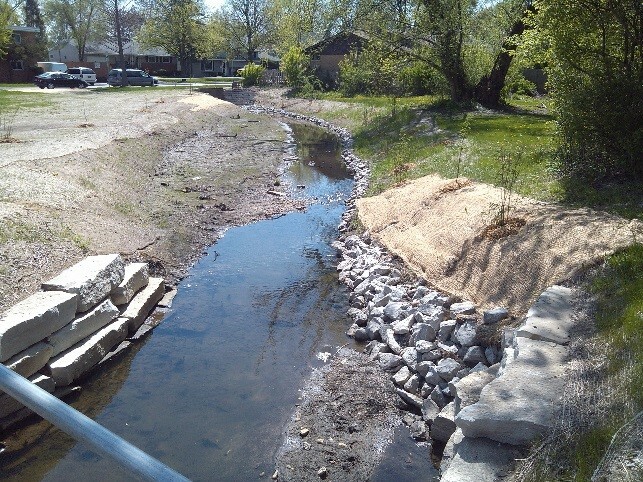 A streambank stabilization program, designed to repair targeted areas from existing erosion, and to stabilize them from future erosion, is part of the Village's Community Investment Program. Periodically the Village performs a streambank stabilization project for highly erodible areas. An easement is necessary to access the property and perform this work. If you are interested in granting an easement over your stream for potential future work by the Village, please call Public Works at 630-434-5489. 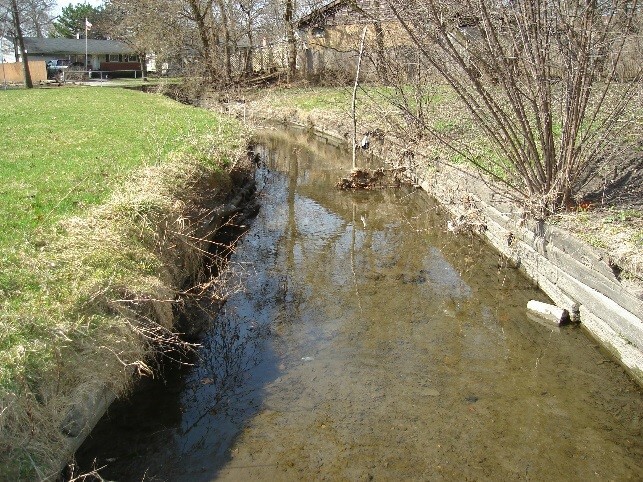 In July of 2015, the Village completed the St. Joseph Creek Streambank Corridor Assessment . 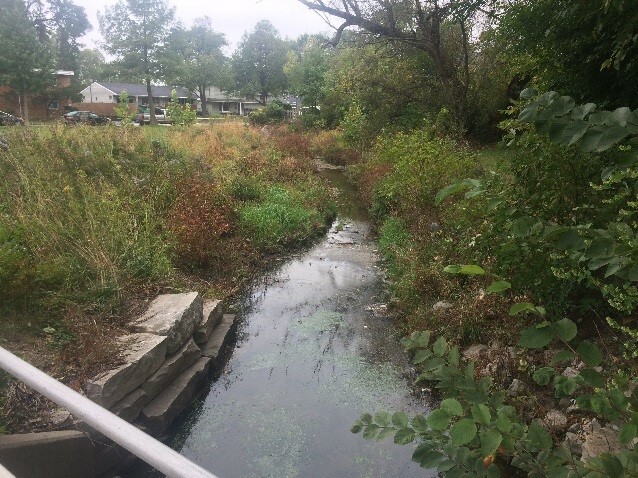 This comprehensive study identified the level of erosion, areas of invasive species, and made note of areas requiring general weed and debris removal along the banks of St. Joseph and its tributaries through Downers Grove. Creek and Wetland Maintenance - what can you do? * Do not dump any chemicals or cleaners in the water that you would not be willing to drink. If it's not good for you, it probably is not good for the fish or plants. * Do not place mulch piles or dump leaves in or near the banks of the creeks. Phosphorus released from the chemical breakdown of the leaves can increase the amount of algea in the water. Algae can significantly decrease the amount of oxygen in the water which can sicken or kill fish. * Remove trash that collects in or around the water, and remove brush and branches that may fall in the water and cause damming. * If you see a significant change in your section of creek, such as a sudden increase in erosion or a collapse of a bank, call Public Works at 630-434-5489 for an assessment. * If there is no buffer along your section of creek at this time, please consider planting native perennials, bushes or trees in the area. * Any development proposed within 100 feet of a wetland will require a construction permit with the Village. It may also require additional permits and reviews at state and federal levels, a wetland delineation and an impact study. Below are some additional resources for homeowners related to creeks. Invasive species are non-native plants that choke out native plants that are more beneficial to our particular environment. 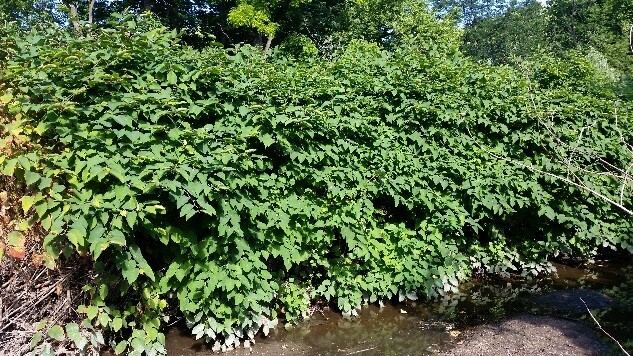 There are a number of varieties of invasive species that can be found in abundance in our area, and Japanese Knotweed (pictured) is particularly prevalent along our waterways. Some of these species were intentionally brought into the area to be used in landscaping, and others were carried into our region by attaching to things such as car tires, animal fur, packing materials, etc. A riparian buffer is a strip of vegetation along a stream or wetland that helps shade the area, stabilizes and reduces erosion along the streambank, and partially protects a creek from the impact of adjacent land uses. It also provides a habitat for animals that live near waterways. Unfortunately, there are many areas in our village where the riparian buffer has been mostly or entirely cleared, but maintaining a buffer is beneficial to the ecosystem of a creek. 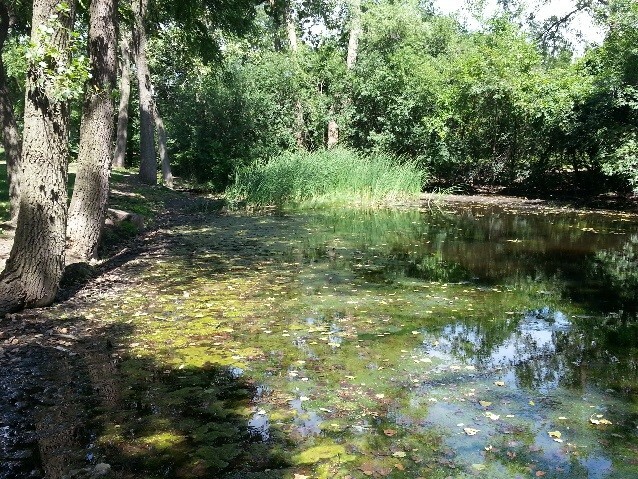 There are quite a few private and public wetland areas in Downers Grove of varying sizes. Wetlands are boggy areas that have specific types of soils and vegetation, and are particularly important for the type of wildlife and plants they support. In addition, they help with flood control and improve the quality of our groundwater by removing some common pollutants. Pictured: Wetland at 40th and Glendenning. While officially delineating a wetland requires analysis from an environmental scientist certified to do delineations, DuPage County has recently developed new informational wetland maps, identifying approximate boundaries and locations of wetlands in the county, with the help of a grant from the U.S. Environmental Protection Agency. It is estimated that more than half of the country's wetlands have disappeared due to man-made causes. Since many wetland functions are difficult and expensive to replace, the Village's Stormwater & Flood Plain Ordinance requires that an applicant avoid or minimize impacts to wetlands. Any development proposed within 100 feet of a wetland may require a construction permit with the Village. It may also require additional permits and reviews at state and federal levels depending on the wetland affected and the work proposed. 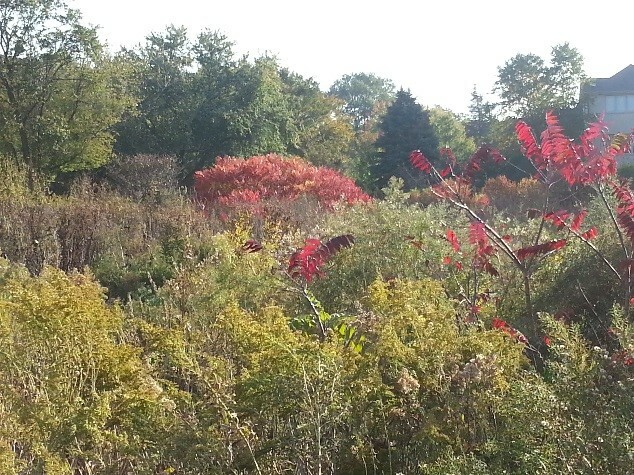 DuPage County "Wetlands and Streams"